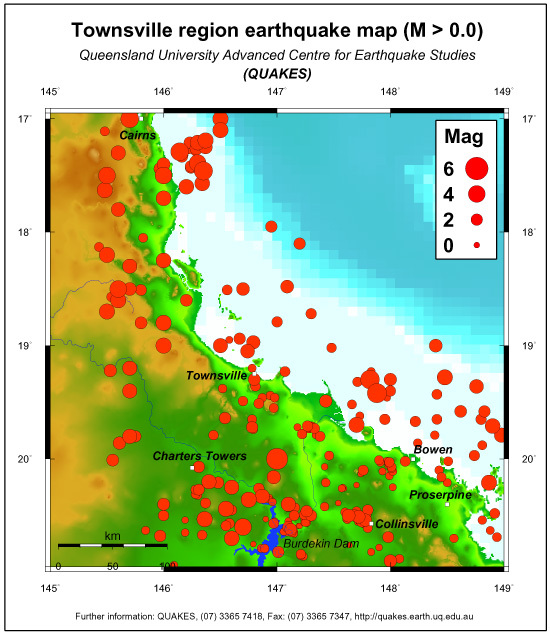 The Queensland catalog contains a total of 493 earthquakes in the Townsville map region, the largest having a magnitude of 5.5. Shown here are Richter magnitude ML > 0 events. Seventeen earthquakes struck within 50 km of Townsville demonstrating the nearby vicinity contains active faults. The seismic network near Townsville is relatively sparse except around the Burdekin falls dam. Instruments installed temporarily in Townsville by UQ had been scheduled for permanent installation after completion of housings by the Townsville City Council.